The manual for the state space tool describes the majority of the functions that can be used to calculate and examine state spaces. This page provides an overview of functions that are not necessarily included in the manual. 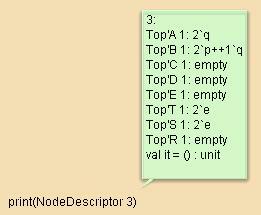 A node descriptor is a string representation of a node in a state space. (Nodes are defined in the manual.) 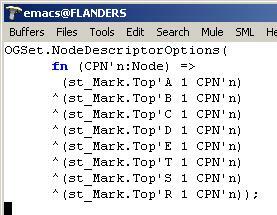 By default, a node descriptor is a string representation of the entire marking of a CPN that corresponds to a particular Node in a state space. 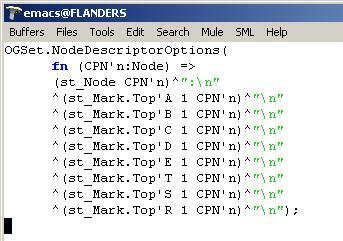 The following functions can be used to generate and manipulate node descriptors. Suppose that the state space tools have been used to calculate the full state space for the example net of the Resource allocation example. The Evaluate ML tool can be used to generate a string representing the marking of the net that corresponds to Node 3 in the state space. If the string is fairly long and therefore difficult to read, the ML print function can be used to print the string. This node descriptor contains quite a lot of information: the first line shows the number of the node; each place instance is shown in the form <Page name>'<Place name> Instance, and the marking of every place is shown, even if the marking is empty. To make the node descriptor more compact, you can start by generating and saving template code for defining the contents of node descriptors. Finally, string representation options can be changed for place instances (below, left), place markings (below, center), and node descriptors (below, right). Printing the node descriptor for Node 3 will now result in a much more compact representation of the marking where place instances are shown by simple place names, empty markings are omitted, and the node number is also omitted. An arc descriptor is a string representation of an arc in a state space. (Arcs are defined in the manual.) By default, an arc descriptor is a string representation showing the source and destination nodes of the arc together with the corresponding binding element. The following functions can be used to generate and manipulate arc descriptors. The Evaluate ML tool can be used to generate the arc descriptor for Arc number 5 in the state space. This arc descriptor shows that Arc 5 is an arc from Node 3 to Node 6, and it corresponds to an occurrence of instance 1 of transition T2 on page Top where the variable x is bound to the value q.